Aligned to Common Core Standards. A Common Core Standards chart is located on page 2, identifying standards covered. The page numbers are noted for easy access. In our ever-changing world, the amount of information we receive is growing constantly. We are subjected to thousands of media images and sounds each day. Most of the time, they flash by us so fast that we barely have time to think about them. In fact, most of these messages are designed to avoid critical thinking on our part. In the past, there was nowhere in our education where we have been taught to critically examine these messages. The main purpose of this book is to create awareness in young people about those messages around them. Once students have acquired the skills to look at media messages critically, they will be better equipped to make decisions about their true value. 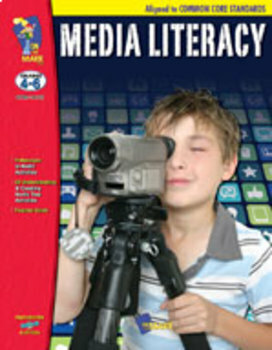 Students will understand media texts, understand media forms and techniques and create media texts. Includes 5 messages in media activities, 59 understanding and creating media text activities and a teacher guide.